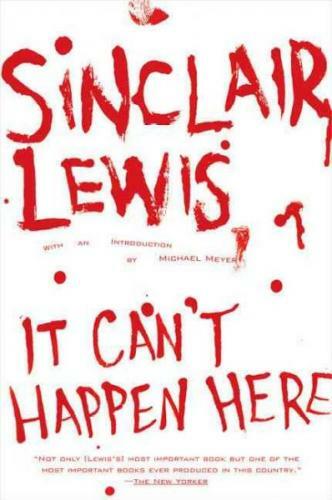 I took along Sinclair Lewis’ novel It Can’t Happen Here on the plane to Austin, Texas this weekend. But I think I may have left it on the plane. I can’t say I am too upset. I am a huge fan of Sinclair Lewis, but this one wasn’t really doin’ it for me. He published the novel in 1935 and he imagines an anti-semetic fascist on the left winning the Democratic nomination over FDR. For those that think this sounds familar might be thinking of Philip Roth’s The Plot Against America which had a similar set-up (published fifty some years after the Lewis book, this is the only Roth book I actually like). I think the lack of subtlety is what made me get kind of bored with this Lewis novel. So, losing this particular book did not upset me much. I highly recommend Sinclair Lewis. Just not this title. Go for one of his truly great books like Main Street, Arrowsmith, Dodsworth, or Babbitt. Good to know. Someone recommended this one to me some time back, but I've still got plenty of his others to read first (having only read Babbitt and Main Street so far). Emily: Maybe it was just a matter of my mood. Fangland…is that a Vampire novel…?